Let me first explain what does the attached mock do. It's an order manager application where the customer support can go through the orders for a customer. That's what the Customer Order screen does. The app also has different screens, and one of them is the screen to add/update the sales tax for a state. That's what you see on the Sales Tax screen. As you notice, the app has two child screens that can be seen at the same time. While the user is going through the different orders, he finds out that the sales tax for the state of CA has changed. Nobody noticed the sales tax change in the complex tax system but a Customer Support rep found out about it. He brings up the Sales Tax screen and updates it from 9.2% to 9.5%. Now the sales tax for the order has changed, so the total for the order has changed. The Customer Order screen should reflect the 9.5% sales tax and the new total. Should the customer support close the Customer Order screen and brings up again (or press the refresh button to refresh it)? The question is, does the app has to expect the user to use the refresh button or take some action to reflect the changes? Should the Customer Order screen update to the latest sales tax and update the total real time in other words reactive to the changes to the other Sales Tax screen? A nice message can be displayed on the Customer Order screen that the total has changed, so he has to save the order. Both the Sales Tax and the Customer Order screens should not be allowed at the same time (single screen interface). When the user brings up the sales tax screen, all other screens are closed. When the Customer Order screen is again brought up for the same customer, it will reflect the latest changes. What I have seen in many desktop apps is the use the first option. I think this approach expects the user to less trust the app. About the third option, there have been discussion about the focus issue of multi screen applications, so use only single screens. In my opinion, using the single screens only increase the navigation and kill the productivity of the user. The web always embraced single page app (eg. google mail). What does the UX gurus think about the user experience for the three options in this example? Or is there a fourth option? 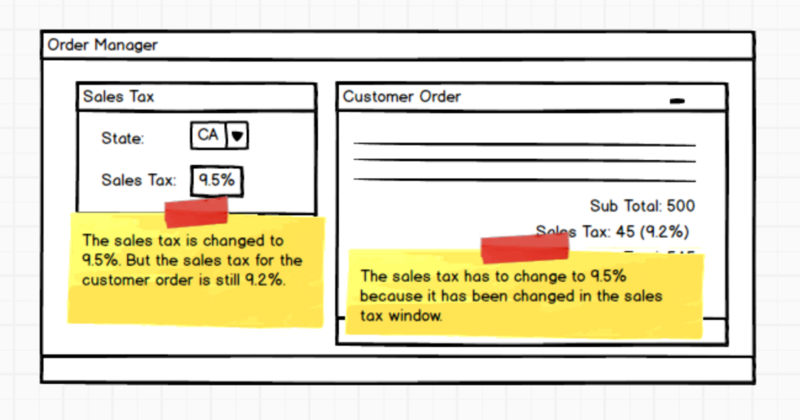 Short answer: make it modal; the Sales Tax module is doing something systematically different than the Customer Order module. They should be displayed separately. So my company uses account management software that (as you would expect) has dozens of screens that do and show different account things. On several of those screens we're able to see demographics for the customer; that data is relevant to the customer service agent no matter what screen she's on. But to change the demographics the agent needs to enter a different/modal screen because those changes should not be confused with other account functions, such as adding a payment plan. Also, I like the UI telling me what it's up to, like "message sent", "page saved", "demographics updated". Maybe add a time indicator, like "Tax updated 2 mins ago" so it draws attention (especially for others) that something has changed, and serves as a confirmation that the change went through (i.e. helps users "trust" the application did what they wanted). While page-refresh (or request), database locking and async can be technical solutions, I think that all three options are a little bit near-sighted. Always manage expectations and tell the customer in the checkout process how sales tax is calculated, that it is subject to change and that there is an actual (support rep) person on the other side working on it. Then let the user know when and why the order amount changed by a few cents or dollars. This is a good opportunity to instill trust and authenticity in the purchase flow. Mock up a few protos and run it by the project stakeholders and see if it sticks. You might just find a succinct answer without requiring engineering tasks. That will make you a hero. Remember: UX design is not limited to a few screens. Consider the entire user journey. And you must also consider the entire user base; the support rep is a user as well. Not the answer you're looking for? Browse other questions tagged real-time-updates or ask your own question. How do you make it clear to the user when the data in a table is updating live (or not)?